The weather conditions for the Men's Interstate Championships were very bad for the heats and moderated into a strong head wind for the finals. NSW took the lead at the 500 metre mark and were never headed thereafter. Ken Leach of Victoria led until 1700 metre mark but the fast finishing Islay Lee of NSW over ran him. Victoria led all the way to win comfortably. 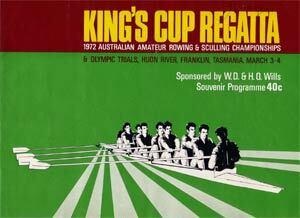 The Fours Championship included ACT represented by a school crew from Canberra Grammar. Unfortunately they were outclassed in this competition. The Canberra Times 15-4-1972 p.38 recorded the situation as follows: A schoolgirl crew comprising Jeannie Dennis, Mandy Miller, Judy Burdack and Elaine Temby, all sixth formers at Canberra Grammar, will represent ACT in the Australian Fours Championship to be rowed on Yarramundi Reach, Lake Burley Griffin, today. The crew was formed only a month ago and has had only one competitive race, finishing a creditable second behind an ANU four and ahead of two Watson High crews in a special event during the Uriarra Cup program three weeks ago. The girls are being coached by Robert Heatly, a member of the successful Canberra Grammar eight which won the Head-of-the-Lake last Saturday. They will be coxed by the Grammar eight cox Will Jamieson. In the Sculling Championship, New Zealander Elizabeth Cato, rowing for NSW, came from behind to win. Shirley Graham was subsequently selected to compete at the 1972 European Championships. 1st VIC – Bow: Megan Tonkin, 2: Gail Johnstone, 3: Valmai Bertrand, Str: June Thorne, Cox: Diane Edge, Cchs: Roy Scutcheon & Kath Suhr. The Lightweight Four Championshiop was an easy win to Victoria who led all the way.